Have you ever read about a plant and thought “I just have to find some?” Well, that’s how I felt when I started researching growing comfrey. It’s like the all purpose herb. You can use it to fertilize your garden, trees and yard, treat wounds and even feed to livestock (in small quantities). It’s truly an all purpose home and garden herb. There are several varieties of comfrey, the most common being True Comfrey and Russian Comfrey. Both are grown and used in the same ways but there are a few differences. True comfrey is the “original” comfrey and is what has been grown for medicinal purposes since ancient times. It’s also known as “knitbone” because of it’s ability to help heal bone and skin injuries. 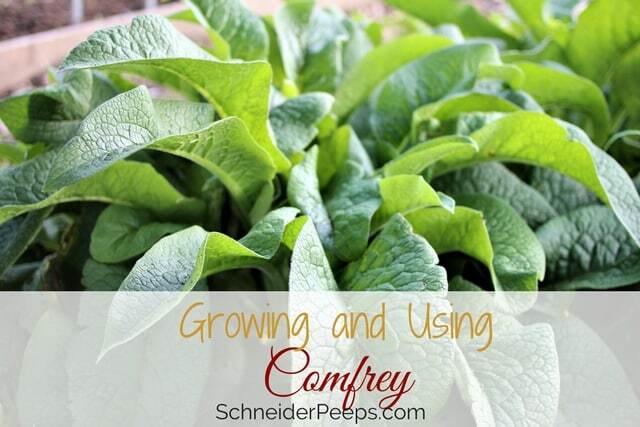 True comfrey is super prolific and can be harvested several times during it’s growing season. Since it readily self seeds, it’s important to harvest true comfrey before it sets seeds. If you harvest after it flowers, be sure to remove the flowers before using the comfrey leaves around the garden. 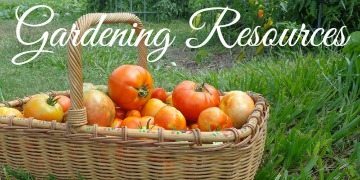 If you don’t want a lot of volunteers in your garden, you’ll need to be diligent about this. Russian comfrey (Bocking 14) is actually a hybrid between true comfrey and prickly comfrey, both of which, are pretty invasive by self seeding. However, Russian comfrey has sterile seeds so you don’t have to worry about it spreading by seed. Russian comfrey is also super prolific and can be harvested several times during the season. It’s propagated from the roots so there’s no concern about using the flowers in the garden. As the comfrey grows, the root system will expand and will eventually need to be divided. I prefer to grow Russian comfrey since I don’t think I’m diligent enough to keep true comfrey from taking over my property. I get my rootstock from Buy Comfrey. They have great prices and great service. To start growing comfrey you need to get seeds (for True comfrey) or rootstock (for Russian comfrey), other than how they’re started, both varieties are grown the same. Comfrey likes full sun and fertile soil, but will tolerate some shade and a variety of soils. I think it’s easiest to start comfrey in pots since the soil needs to stay moist until it spouts. But it can be started directly in the garden, too. Once they get their second set of leaves, I move plant them where I want them. When planting comfrey, you can dig a hole about 10″ across and 1-3 feet deep and add lots of compost to it. Then plant the comfrey in it and water well. You can grow comfrey in pots but since they have such a long taproot you want to use a pot that it’s deep (like a 5 gallon bucket). Comfrey is cold and heat hardy and can survive temperatures from -40°F degrees to 120°F. It grows well in zones 3-9. The taproot can grow 8-10′ long, so comfrey is often used to break up clay soil. Mature comfrey is drought tolerant and will mine the nutrients from deep in the soil. The nutrients are stored in the leaves which is why they are so great for mulching. At maturity, comfrey is about 2 feet tall and about 3 feet in diameter. It’s recommended that you don’t harvest comfrey right away. It’s best to let it get established, so wait at least three months before harvesting. Longer if you planted seeds. After the comfrey is established you can harvest the leaves a few at a time. When the plants reach about 18″ you can do a big harvest and cut them back to about 2″. Comfrey has the most nutrients just before it flowers. If you can, try to time your harvest so that you harvest before it flowers. There are a lot of uses for comfrey in the garden, with livestock, and in the apothecary. I do want to mention that it’s not advised to use comfrey internally. edited to add: I realize that there is some controversy surrounding the studies that caused this warning to be issued, however, I prefer to err on the side safety so I do not recommend that comfrey be used internally or on broken skin. There are safer herbs that can be used for any issue you would use comfrey internally for. Of course, you will need to make your own informed decisions for your family. 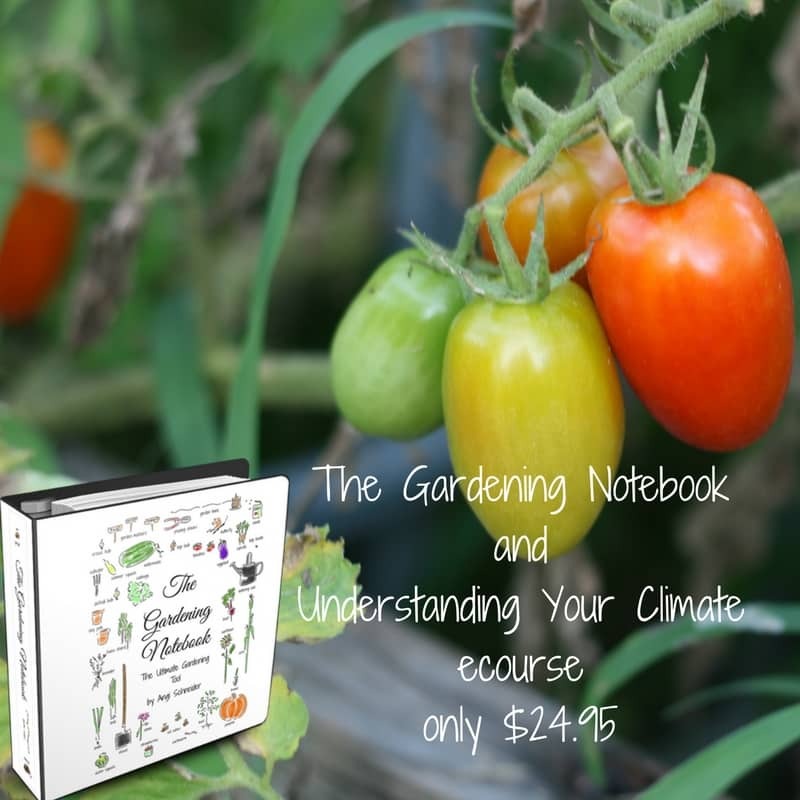 In the garden, you can use the chop and drop method and use the leaves to mulch the garden and orchard. As the leaves decompose they’ll fertilize the soil. You can also plant comfrey in tree guilds, here’s a great guide from Tenth Acre Farm. Comfrey can be used in fodder for livestock – not in large amounts but as part of a varied diet. Some people suggest letting the leaves wilt for a couple of days before offering it to the livestock, if they refuse it fresh. I also use comfrey in some of our salves and make comfrey poultices with it. 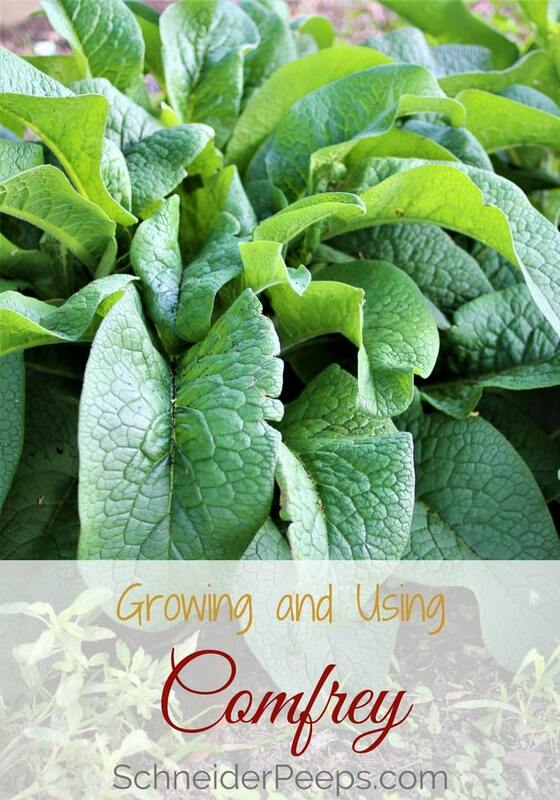 Have you ever grown comfrey? Any pointers? I tried growing comfrey last year, and was not successful, but I will try again. Making my healing salve will be cheaper if I can grow my own. It was just that I planted to soon, and I brought them in the house. On a very cold night we had a fire going, and the plants were to close to it. We thought they would be fine, they were on the floor, and our fireplace sits about two feet off the floor. I was frustrated and did not attempt to re-plant, we lost alot of plants the same way. I grow comfrey , its easy to do. dug some up and transplanted it . grows well in part shade . good for cuts and scrapes. good in tea . but limit it , can build up in your system , and become toxic. eat the blooms , there sweet. I know that some people use is as a small part of their fodder for livestock. We’ll be experimenting with some of that in the future with our chickens. Do you think it will grow back? Absolutely! When people say “it’s invasive”, they aren’t kidding. Now if only I can snag some to dry for salves before the deer get to it this summer! I never use the roots internally (that is where the toxicity is) but to make my salves. Young leaves find their way into my salads and tinctures. This was such a great post. We’ve been starting a medicinal herb garden. Now I want to plant comfrey… Found heirloom non-GMO seeds for cheap on Ebay. Oops… bought more seeds… Said I wouldn’t buy more seeds. LOL! The name of the comfrey is Bocking 14 name after the village of Bocking in Essex England where the HDRA now Garden Organic started. Much of the research on comfrey was done there and you can read about it on their website. Thanks, Chris! I wondered why is was called that. I’ll have to look a the site. We use comfrey around our fruit trees and “chop and drop” it to feed the soil, usually about twice a season. You can literally take a tiny 4 inch piece of the root and plant it to get another comfrey in a year. It’s super easy to propagate in this way. That’s awesome, Megan. Those aer things I’m hoping to do with the comfrey. I’m going to plant it among our citrus trees but hope to plant some among our peach and plum trees in the future. As a child I was made to drink the water after my mother boiled the leaves! My siblings and I were told it was good for us. All I can remember is it tasted foul and of no benefit to my physical health. That’s interesting. I’m sure my kids will have similar stoies. Thanks for the article link, Margit. I really respect Susan Weed and her contributions to modern herbal medicine. I, personally, am fine with using some comfrey in limited amounts for specific conditions, however, since I’m not an herbalist and since this article is about growing comfrey I felt it prudent to put the disclaimer about not using comfrey internally. But, I’m glad you shared the link so that those who are interested in using comfrey internally can have some good information about how to do it safely. This is very interesting to me! We had comfrey when I grew up ever since I was 11 years old. In the first place it was so wild, it was in Riceville, Iowa, then we howed lots of it out of the garden. It grew all over the garden. So in the next place it was planted away from the garden. 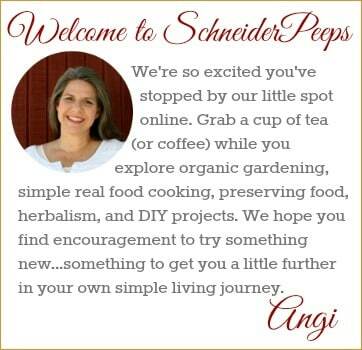 Does the kind you have, Angi, multiply itself? I often wondered whether or not it would grow down here. So I am glad to know. Comfrey is good stuff. I use it for bruises and I’ve used it with my herbal calcium mixture. I mixed it with equal parts. I didn’t have specific instructions. But maybe I should cut it down in there. But yes, comfrey is a great contact healer. And high in calcium. But let’s be careful not to overdo it internally. I bought mine at a local nursery (Earth Works) and the owner said it would grow great here. I bought the kind that is infertile so it has to reproduce via rootstock not seeds. I’m planting it among our citrus trees. Did you see that link above from Susan Weed’s site? It has lots of good info. I just read this about comefry …..
What’s the difference between this plant and true comfrey (Symphytum officinalis)? The Bocking 14 cultivar of Russian Comfrey (Symphytum x uplandicum) is a sterile hybrid that will not self-seed and is extremely robust and vigorous. The true comfrey (Symphytum officinalis) is a bit less vigorous of a grower, has more elongated leaves and (I think) prettier flowers, and does indeed make seed. Although both types of comfrey (Russian and True) are useful for making medicine and making compost, in an ideal world one would use the bocking cultivar for producing large amounts of biomass for permaculture gardens, composting, and animal feed, and one would use the true comfrey (Symphytum officinalis) for medicinal purposes. Again, both types (and other species as well) are used interchangeably in agriculture and in medicine. Should I plant TRUE comfrey then, since my main purpose is medicinal purposes? Ideally, I would think you would want to plant true comfrey for medicinal purposes. But it does self seed so you’ll want to make sure you plant in a place where it will be ok to invade a little. I really don’t think there is a right or wrong answer, just some things to think through to make the best decision for you. Oh but the flowers are soooo prettty. I used to grow it years ago when my sister and I owned a little herbal themed gift shop. You’ve got me think about it again. Thanks. How fun to own an herbal themed gift shop with your sister! We haven’t gotten to the producing flowers stage yet, thanks to rabbits and chickens but we keep trying. Can you tell me what temperature is optimal for starting my own Comfrey plant? Hi Vici, I talked with a friend of mine who grows and sells comfrey and comfrey roots. He said that as long as there isn’t sustained freezing temps the comfrey should start just fine. He said you are starting it indoors, normal household temps should be fine. Hope that helps.